Showing 1-5 of 22 items. Collective Alliance "Donterrezina i KO"
Rubber-cloth expansion joints are designed to prevent possible gas leakage in the areas of stress of medium and low pressure underground gas pipelines, in areas with increased seismic activity as well as in areas which are exposed to soil movement under pressure from mine workings, landslides, etc. Compensators are installed at the joints of gas pipes at a distance of 30-100 meters from each other and work on tension, compression and bending in conditions of constant contact with natural gas preventing gusting of gas pipelines. - Compensating ability for compression-stretching - up to 150 mm. (counting from the normal unstressed state). 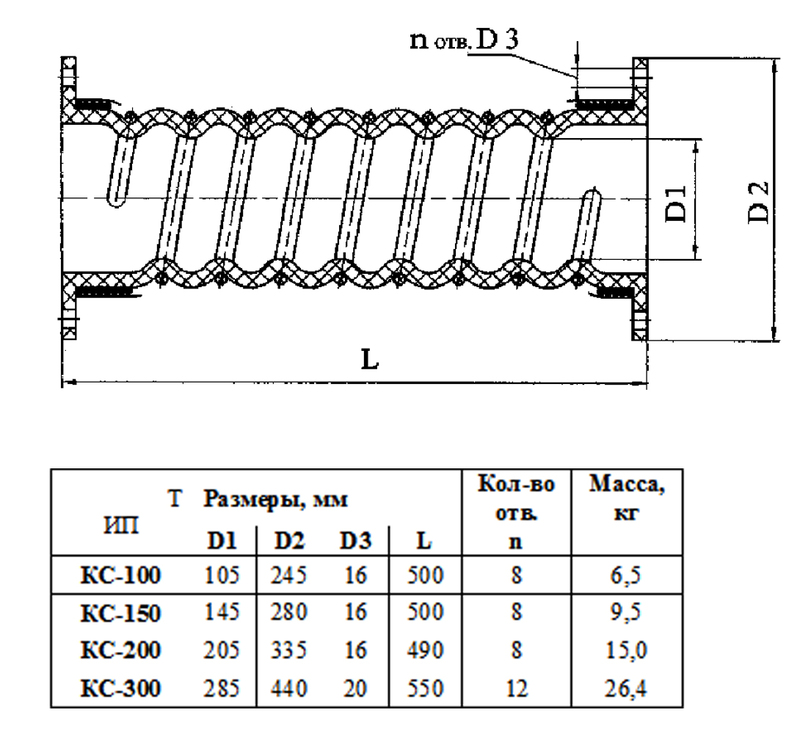 - Operating temperature range is from -30 to + 40 ° C.
An example of the designation of the compensators "KS-150" where KS is the type of compensator (medium pressure),150 - diameter of the nominal passage, mm. It is designed for the manufacturing of rubber products and is used to seal fixed joints to prevent friction between metal surfaces, to perceive single shock loads as well as gaskets, decks and other non-sealing joints. Sheet size up to 1000x1000 mm. -30 - +80 Air of rooms, vessels: nitrogen; inert gases at a pressure of 0.05 to 0.4 MPa or fresh, marine, industrial, sewage without organic solvents and lubricants: a solution of salts with a concentration up to the saturation limit; acid, alkali concentration of not more than 20% at a pressure of 0.05 to 10.0 MPa. - thickness: from 0.9 mm. up to 12 mm. They have a wide field of application in many branches of industry (mechanical engineering, fuel and oil industry, etc. ), designed to seal stationary joints of mechanisms, to prevent friction between metal surfaces, to damp vibrations and to perceive shock energy in single loads. They are used as gaskets and decks. Working medium - water, acids, alkalis, air, nitrogen, inert gases. It is effective at temperatures from -45 ° C to + 80 ° C.
During storage rubber products must be protected from direct sunlight, oil, gasoline, kerosene, their vapors, acids, alkalis, gases and other substances that can destroy rubber. Transformer technical plate UM (GOST 12855-77) - vulcanized rubber plate is designed for manufacturing various stationary seals used in transformers and other electrical devices. Oil resistant rubber UM (transformer plate) is designed for sealing joints, covers, flanges, bushings in power oil transformers. Operating temperature from -60gr. To + 100gr. Working environment: - Transformer oil. The transformer plate UM in the process of operation does not emit free sulfur.d also as decking and dielectric in electrical appliances. It is also possible to produce other thicknesses by agreement. The silicone plate withstands steaming, hot water. It is used as an insulating material at high temperatures. Used for the manufacturing of rubber products which are used as fixed joints as gaskets, sealing rings, etc. Prevents friction between metal surfaces for the perception of single shock loads and also as decking and dielectric in electrical appliances.